Watching Rachel Notley is a lot like watching Jack Leighton used to be: an all too rare experience of public trust in a politician. Remember the unprecedented ‘orange wave’ that swept the NDP into its current position as Her Majesty’s Loyal Opposition? What exactly was it about Jack Layton that inspired such trust and hope? Well, I have a pet theory about that: the Canadian voter is actually smarter and more clued in than we give him credit for. He/she can smell corruption on politicians, like dogs can smell each other, and decide whether to like or dislike. Alas, many political dogs give off a distinctly corrupt odour these days, they have managed to spoil the political atmosphere in Canada. So when a politician comes along who doesn’t smell of corruption, the voter immediately recognizes her and heaves a hearty sigh of relief. Oh, where have you been, they think, and begin to follow this person, hoping against hope that this time, they have found what they’ve been searching for, high and low: someone they can trust with their political lives. That recognition is what swept Rachel Notley into power. Being a woman also helped. Because, like it or not, most of the truly corrupt and powerful are, as of yore, men. Generally, white men. Generally, old men. How lovely it is, then, to find a woman who is none of these things. And who, furthermore, is smart, committed to her cause, and not bad looking, if one is allowed to comment on that. 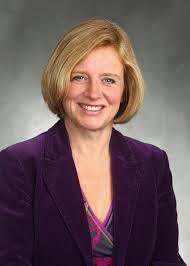 Notley has it all. She is the complete package, and all her supporters can do now is to hope that she will find her stride, will not falter or stumble. Already, the naysayers are out in full force. There is no doubt that she has an immensely difficult path ahead. How will she balance the demands of her conscience with the oppressive weight of the oil industry, used to being coddled by the Alberta government, already crying foul before she has had a chance to do anything at all. Make no mistake: this is the supreme test of character and moral fortitude. Can Notley put this immensely powerful group into its place and still continue to govern a province that has become addicted to the black gold they produce? Or will she buckle under the pressure, and give them what they have always had: a free ride? What will she do? We rarely get a front seat to a drama Shakespeare himself could not have imagined. But it is here, now, and we Canadians owe it to ourselves and to her, to not only watch what she does, but to let her know that we are aware of what it all means. And that we are on her side, cheering.